. . . atmospheric and thought-provoking performances . . . [clarity is employed] throughout "Missa Papae Marcelli" with delightful results . 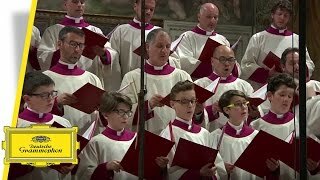 . . [the "Motets"] contain four premiere recordings and continue the broad, solid vocal sound of the Mass . . . [for the "Ave Maria"] they also use falsettist countertenors, whose tone noticeably lightens the overall texture and helps to find a more intimate quality. This result is fascinating: the sheer sense of height and depth of the building is considerably enhanced and suddenly the polyphony is soft-focus. Simply titled “Palestrina”, it is a new release by the world’s oldest choir – performed and recorded in the heart of the Catholic Church, and featuring works by the most celebrated Italian musician of his time and reformer of church music: Giovanni Pierluigi da Palestrina.